This version is filled with Chantilly cream. You can serve them with ice cream or sorbet in place of the cream, which I sometimes do. I went with the Chantilly cream this time as it's a million times easier to photograph in the middle of an Australian summer. These guys were served on a plate of lemonade jelly. Jelly is a really fun way to mimic the shimmering and reflective water surface of a pond. I've alternatively served them on a number of fruit sauces – peach or strawberry being a favourite. In a clean, grease free bowl, beat the meringue to soft peaks. Add caster sugar a tablespoon at a time, beating it in well after each addition. Continue beating until meringue hits firm peak stage and is glossy. Spoon meringue into a piping bag fitted with a 6mm round tip. Pipe 14 teardrop shapes for wings, and 7 number two shapes for the head and necks. Pipe 7 oval shapes about the same length as the wings to make the bases. 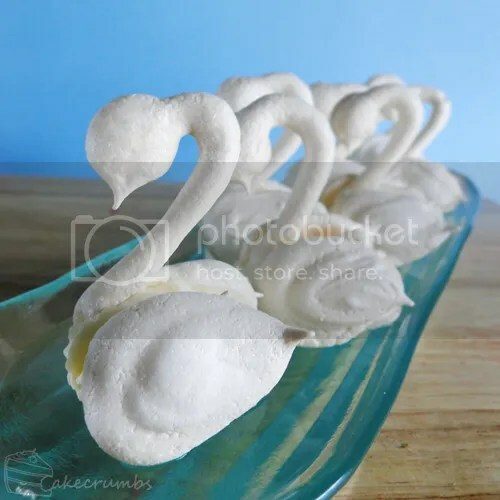 If you have any meringue left, or room on your baking tray, pipe some extras of various swans parts in case of breakages. Bake meringues for 30-60 minutes. 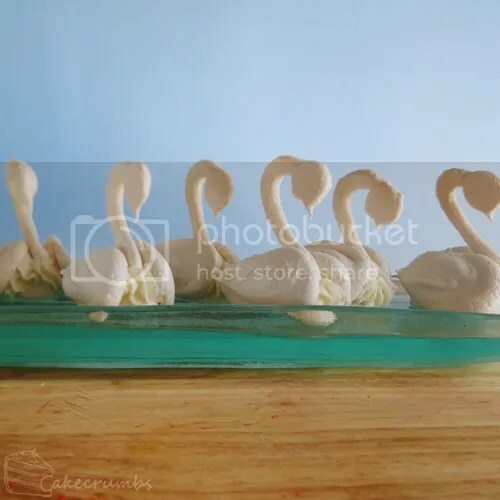 Baking time will depend on the size of your swans. 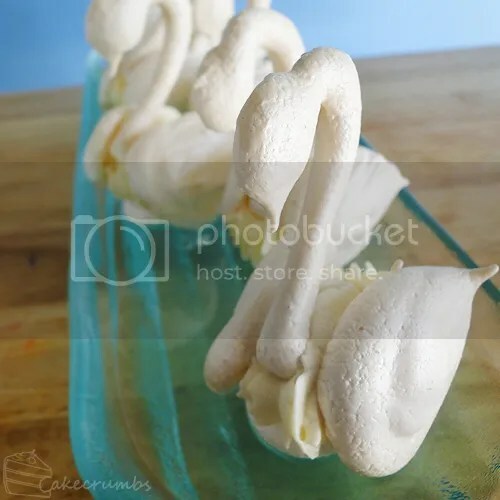 Meringues will be dry and firm when done and you should be able to lift them easily off the baking tray without them sticking. Allow them to cool inside the oven with the door ajar. 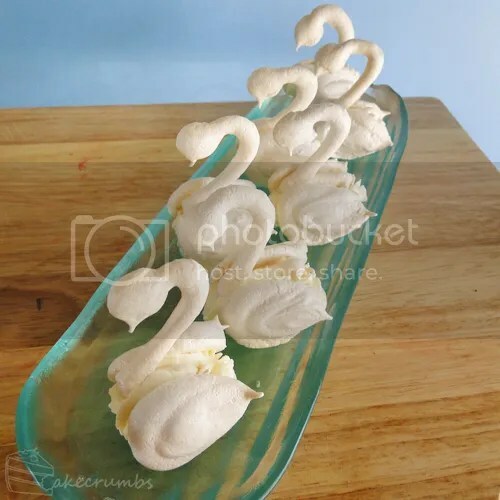 Just before serving, place the swan bases onto your serving platter. Pipe chantilly cream, or scoop ice cream or sorbet onto the bases. Place the swan head/neck into the filling, then place two wings either side of the base. Serve immediately. And since you have give notes on how to make the swan shapes, I might even have a chance at making something that looks swanlike. Awesome. 😀 The shapes are super easy to make. I’m sure you’ll do it brilliantly! These look great on the lemonade jelly. The combination of the meringue, cream and jelly tasted really good. I just used one of those make-your-own-flavour type jellies and added lemonade to it, added a little extra gelatine and poured it onto the plate. Took about an hour in the fridge to set.